There is a growing trend in the United States towards assortative mating—a clunky phrase that refers to people’s tendency to choose spouses with similar educational attainment. Rising numbers of college-educated women play a key role in this change. It is much easier for college graduates to find and marry each other when there are more equal numbers of each gender within an educational bracket. Patton was dubbed a busybody, an elitist, and an anti-feminist. But while the idea of finding a spouse during college was outdated, her basic advice to marry a man “worthy of you” seems to be one most college graduate women were already heeding. Assortative mating may also have an impact on intergenerational mobility, since it widens the gap in resources available in different households. Families with two college graduates will have more money to invest in their children and may be able to afford private K-12 schools or homes in top-notch school districts. They are also more likely to have jobs offering greater flexibility, allowing them to better balance work and family life. At the other end of the spectrum, less-educated couples or single parents are more likely to face insecure working conditions, lower pay, and limited access to high-quality schools. Race is a factor in patterns of assortative mating. Black women face more difficult “marriage markets” than white women, given current rates of intermarriage according to work from University of Maryland sociologist Philip N. Cohen. Black women have the lowest rates of “marrying out” across race lines, in part because of racist attitudes to inter-marriage. Just 49 percent of college-educated black women marry a well-educated man (i.e., with at least some post-secondary education), compared to 84 percent of college-educated white women, according to an analysis of PSID data by Yale sociologist Vida Maralani. 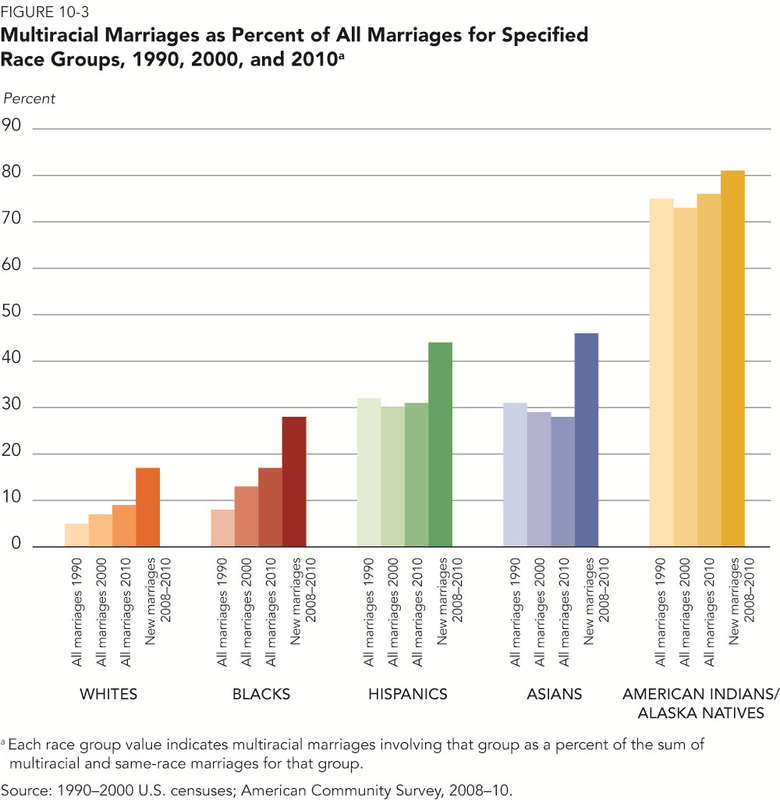 In this Long Memo, we examine race gaps in marriage patterns in terms of educational sorting, using 5-year estimates from the 2008-2012 waves of the American Community Survey. We focus in particular on college graduates. There is a growing “marriage gap” in the United States. Marriage rates among the non-college educated population have fallen sharply in the last few decades, and sharpest of all in the black population. 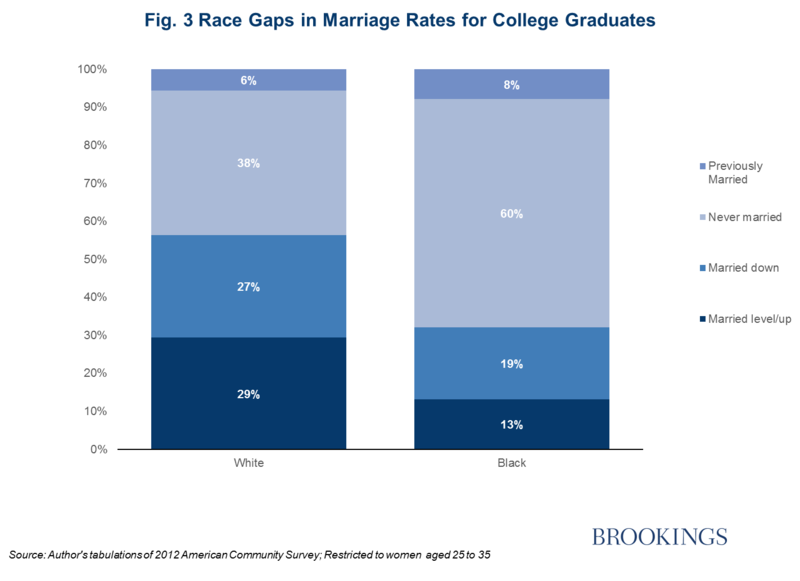 Black-white gaps in marriage rates reflect different levels of education by race, but there is an important gender gap too. Young white women—aged between 25 and 35—are the most likely to have at least a BA (37%), followed by white men (29%), black women (23%) and black men (16%), according to our analysis of the ACS. We focus on the 25 to 35 year-old age cohort because these are the years during which most women, particularly college graduates, enter into their first marriage. There is a gender gap here too: Frey reports that three-quarters of black-white marriages involve a black man, rather than a black woman. By definition, the black female college graduates who do not marry are not assortatively mating, since they are not mating—defined as marrying—at all. This helps to explain why white women with college degrees are more than twice as likely as their black counterparts (29% v 13%) to be married to someone of equal or greater educational status. This gap in household income status is not surprising, given some of the patterns described earlier. 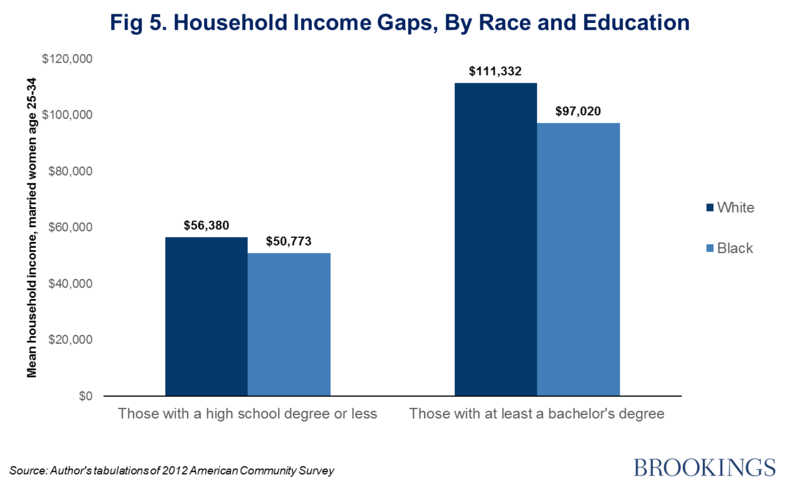 One of the benefits of a college education is a higher likelihood of marrying someone with equal education status, which typically translates into higher household income. But as we have seen, this is a benefit that seems to accrue more often to white women than black women. The stubborn race gaps in our society, especially those facing black Americans, are one of the greatest equity challenges of the 21st century. This is not just an issue of inequality at any point in time—it is an intergenerational problem. The United States’ social mobility problem is in large part a reflection of the truncated life chances of black children: not only in terms of lower rates of upward mobility from the bottom rungs of the income ladder, but also the much higher risk of downward mobility from higher up the distribution. Most black children born into families in the middle quintile will fall into one of the two income quintiles below as adults, for example, according to recent work by Scott Winship. There are a complex set of factors at work here, including school quality, wealth gaps, criminal justice, college access, neighborhood segregation and discrimination. But assortative mating—or lack of it—may play a role too. Marriage rates in the black community are low and falling. 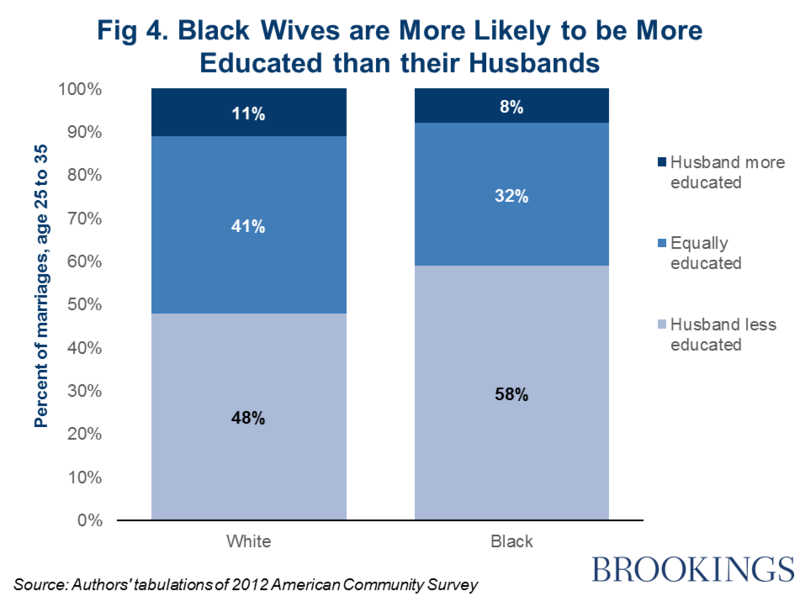 Black women are the group who are least likely to “marry out” across race lines. Black men are the second least likely race/gender group to gain a college education, after Hispanic men. 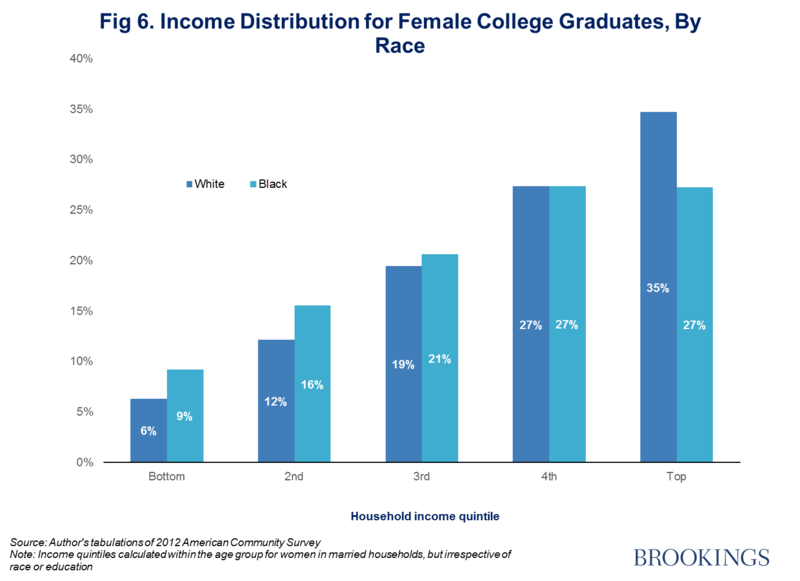 The combination of these factors means that black women who get a college education are less likely to find a college-educated husband. 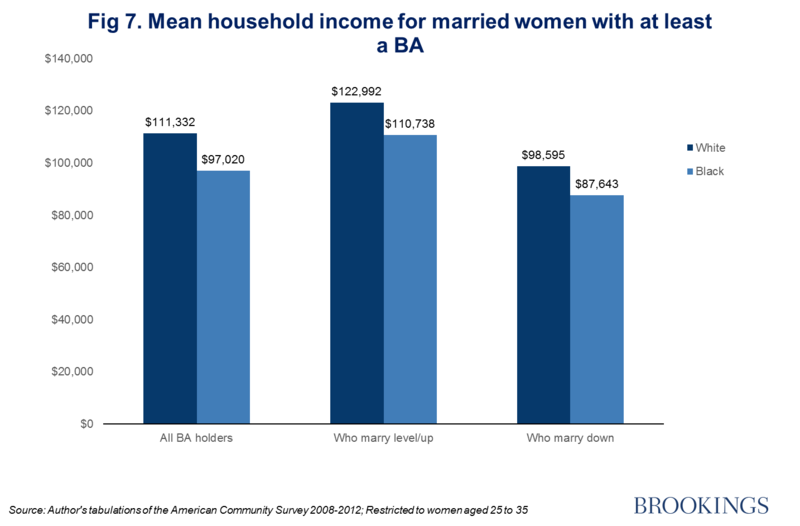 It can be seen as good news that they are willing to ”marry down” in terms of education—rather than not marry at all—but, other things being equal, marrying down will make it more difficult for them to achieve and maintain a middle-class standard of living than if they married college-educated partners. It may also make it harder for them to help their children surpass or at least maintain their status on the income ladder. The interaction between gender, race, education, and marriage helps to explain the replication of social status. 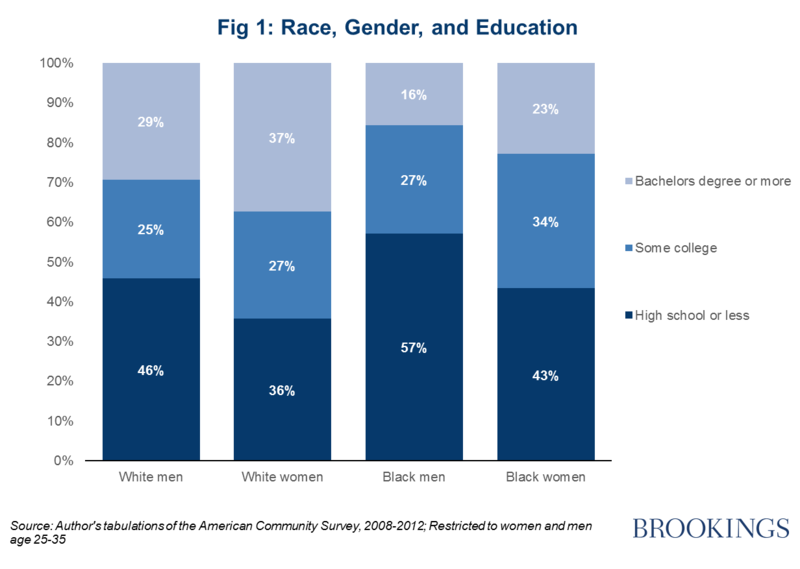 Even if black women rise up the ladder, in part because of their efforts to acquire more education, one of the key mechanisms for maintaining that higher status for the next generation—assortative mating—is less available to them. This is yet another reminder that even if, as Gideon Rose writes in Foreign Affairs, there has been progress towards a “post-racist” society, we are still a long way short of a “post-racial” one.